I too am a fighter of windmills. I just love how convinced Don Quixote is, that not only are the windmills giants, but that those giants (drama/conflict/obstacle/insert your own demon here) are what he expects and par for the course when it comes to adventure. That’s me. I have a hard time enjoying the adventure unless I’m making progress on a plan towards a goal, unless I’m fighting the good fight. And if everything is okay, well then something is really wrong. Nellu usually just laughs when I get going on my giant monologues, which helps. 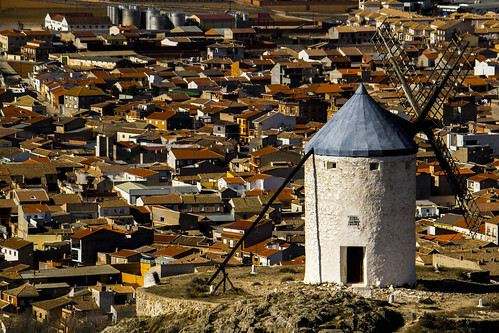 On our Spanish road trip, we stopped in the sleepy town of Consuegra to visit Don Quixote’s giants. Life lesson #316: If you’ve got your eye out for giants, you might miss the windmills.